I have said this before and will say it again: I don’t like to spend a lot of money on anything. I am a saver (but my boyfriend is better at that than me) and so I am all up for affordable things with great quality and that reflects on my makeup collection. I think that sometimes, good makeup is not only about the product itself but also the technique and tools you use. I was once at Superdrug and a kind lady said that my makeup looked great. When she asked me what products I used, straight away I said it is all drugstore and she was so surprised that I could not even imagine, mentioning that it looks like you used Estée Lauder products. Oh well, that was a hell of a compliment and it made my day. 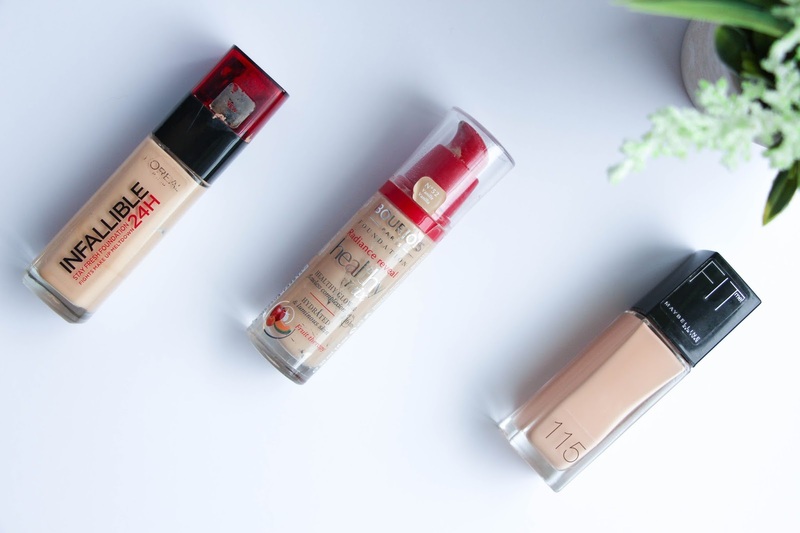 All of this to say that I am an absolute fan of drugstore foundation and my goal was always to find the perfect one in terms of coverage, finish and durability. 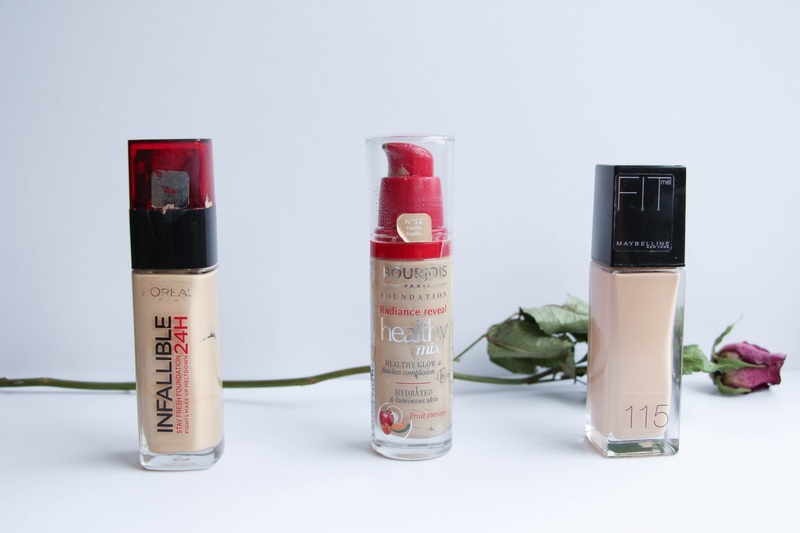 Today, I am sharing with you my Top 3 Drugstore Foundations. First of all, my all time favourite – the L’oreal Infallible 24H Stay Fresh Foundation (Shade 120). I can’t even tell you for how long I have used this foundation as it has been quite a few months (or maybe a year). Sadly, for the last couple of months I stopped wearing this foundation simply because the lightest shade was too dark for me – pale skin problems. But last week I fake tanned for the first time and so the colour matches perfectly now and I fell in love for it over again. L’oreal Infallible 24H Stay Fresh Foundation is, for me, the best drugstore foundation out there. It is beautiful to blend, a great colour range, amazing coverage (medium to full, easily) and it lasts so well on your skin. I am still to find one that will overcome this baby but I don’t think I will, honestly. With the amazing coverage this foundation gives you, you would be blown away by how light weight it feels. With a thin layer you get such a flawless and weightless complexion that it is unimaginable. Can’t you tell how much I love this foundation? Yeah.. I know. Running second is my Bourjois Healthy Mix Foundation (Shade No 52). Another one that is absolutely amazing. This would be my go-to foundation during spring/summer days. It has a beautiful dewy finish without looking oily, a great medium coverage that can easily be built up to full and it makes your skin look so healthy and glowy! I have an empty bottle sitting here and there is a tear running down my face. I am in need to buy a new one asap. I have had so many compliments when wearing this foundation that I just want to put it on my face day and night! And last but not least, the beautiful Maybelline Fit Me Foundation (shade 115). By mentioning this one last does not mean I love it less. It is also one I can easily apply for weeks non stop but the only thing that stops me now is that it has a pink undertone that I haven’t noticed before and because I have olive skin, it looks a bit off. I am trying to find a different shade that suits me best but for now I will make it work. This one, again, has a beautiful coverage (medium to full, that is what I am all about) and quite a dewy finish that I love. It is so easy to apply – either with a brush or beauty blender, give it a few seconds and it just sits on your skin so nicely, I love it. The only thing that I can say is that, on me, this foundation tends to fade in certain areas like my chin and around my nose as I tend to get oily there throughout the day so this isn’t the perfect base for my long days at work, Apart from that, it is as great as the other two. To apply any of these foundations I always go for by trusty Real Techniques Miracle Complexion Sponge as this one gives the most flawless finish without having to use a lot of product. The other option is the Real Techniques Sculpting Brush – a brush that is made to contour but it is beautiful to blend your foundation and it gives an amazing airbrushed finish. I love it. 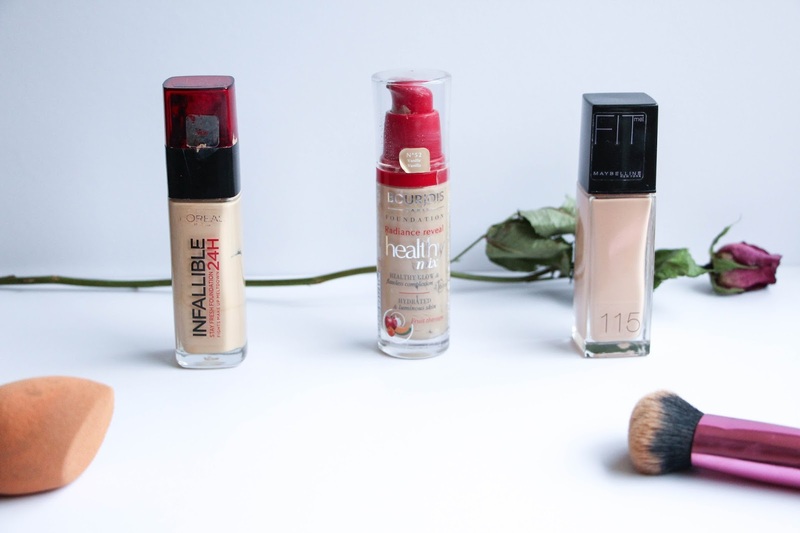 What is your favourite drugstore foundation?